Double crispness of chocolate and monaka wafers! 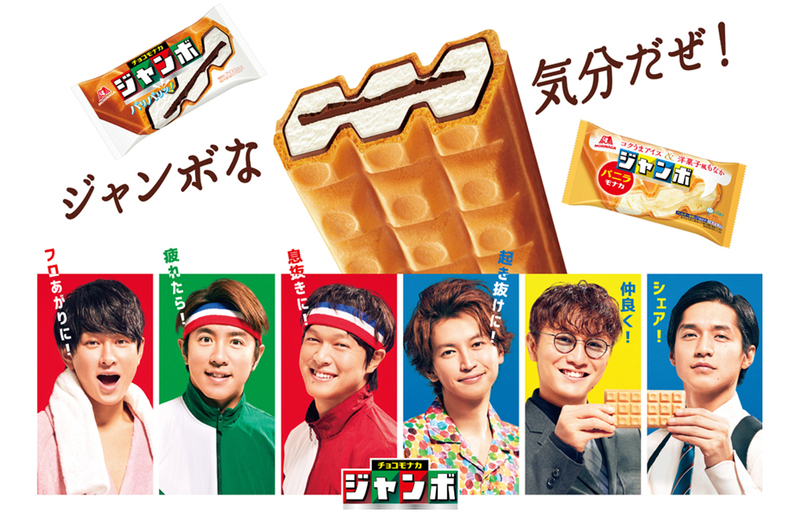 Morinaga’s longtime big seller Choco Monaka Jumbo has a thin sheet of chocolate sandwiched by ice cream, creating an exquisite balanced blend of flavors—monaka wafers, smooth ice cream, and crispy chocolate. As you bite, the flavor of monaka wafers spreads in your mouth. Now, bite into crispy chocolate surrounded by smooth ice cream! Choco Monaka Jumbo is the only ice cream that gives you this delicious crispness! After you take your first bite of the Jumbo, have a close look at the cross-section. The monaka shell casing is jam-packed with ice cream from end to end. The thin chocolate liner prevents the moisture in the ice cream transferring to the monaka shells, helping to maintain that special monaka crispness. The monaka shells are molded with a 3 x 6 grid pattern to create 18 snap-off pieces, enabling division into various portion sizes for sharing with family and friends. From the first piece to the last, you can taste crispy chocolate wherever you bite on a Jumbo. Monaka, ice cream and chocolate are combined in a golden ratio carefully formulated by the developer. “I do love Choco Monaka Jumbo but there are times when I feel like the simpler taste of vanilla ice without the chocolate.” Those times call for Vanilla Monaka Jumbo, a monaka-shelled ice cream treat for vanilla ice lovers that looks simple but contains some secret surprises. Monaka wafers contain almond powder. 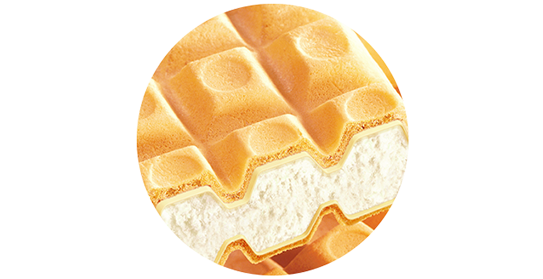 To achieve a good balance with the simple sweetness of vanilla ice, the wafers are formed out of slightly sweet pastry. The chocolate liners inside the wafers, as in regular Choco Monaka Jumbo, prevent the moisture in the ice cream from transferring to the monaka shells. The wafer casing of Vanilla Monaka Jumbo is lined with white chocolate, which is inconspicuous at first glance. It secretly supports and enhances the sweetness of the vanilla. 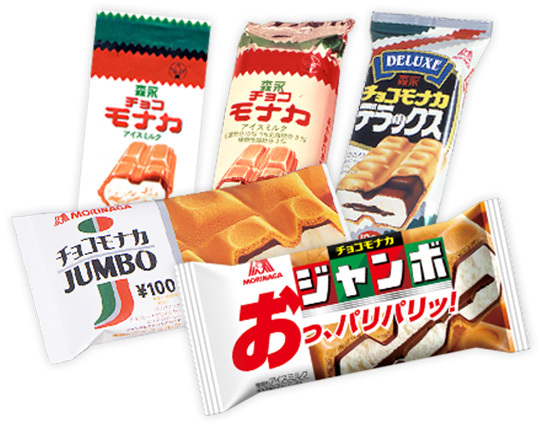 Vanilla Monaka Jumbo uses the type of vanilla ice cream categorized as “ice cream” to present the flavor of milk. The result is a delectable taste that combines the richness and refreshment of milk and is never boring. * Among other types of ice creams, “ice cream” contains the richest milk solids and milk fats, and is therefore considered to be the most tasty and nutritional form. What’s the secret behind Choco-Monaka Jambo’s annual sales of 1,800 million ice cream packs? The answer may shock you — it’s all down to the freshness of the ice cream. Check out the history of Morinaga’s Choco Monaka Jumbo and its delicious crispness.